“Macaroni and Please” is a training kit designed for child-care providers, educators and parents. It was written and designed by The Civility Group Inc. and consists of thirty 10-minute manners lessons for children ages 3-7. The lessons can be taught in two weeks or spread out over an entire month. Each lesson is designed for 10 minutes but may be expanded up to 1 hour using the suggested activities and worksheets per the instructor’s discretion, making the program a comprehensive 30-hour curriculum. The kit includes detailed lesson plans for instructions plus activities, worksheets and practice exercises for participants. Lessons include everything from basic manners (making introductions, showing kindness to others, telephone etiquette, respecting yourself, dinning skills, manners at school, thank you notes) to sleep over and party etiquette, just to name a few. The no-nonsense materials package includes an easy-to-follow 111-page Instructors manual and a 34-page master file for reproducing worksheets and participant materials. Children are most receptive to learning manners between the ages of 3-7. Teaching children the rules for social conduct gives them social skills that will benefit them throughout their lives. Manners are not just about which fork to use, they are about fostering respectfulness and teaching responsibility. Shipping & Handling is $20.00. State sales tax of 8.25% will apply in Texas. We accept all forms of payment. You will receive our "Macaroni and Please" kit described above plus "Proud to be Polite"
"Proud to be Polite” is an in-depth reference for the basics of etiquette aimed at children ages 5-12. Our "Proud to be Polite" materials were developed by The Civility Group Inc., with excerpts contributed by Louise Fox Protocol Solutions, to help optimize a child's social confidence. "Proud to be Polite" is a perfect supplement to both the "Macaroni and Please" and "Confidence is Cool" programs. Topics are arranged into three sections: Respect, First Impressions and Communication Skills. The materials package includes an easy to use 58-page instructor’s guide and a 28-page master file for reproducing worksheets and participant materials. Once children learn basic manners, parents and teachers can build on this understanding to teach children how to behave in a range of social settings, how to manage conflict, and how to show kindness and consideration for others. The best just became affordable. Over $350 in value, if purchased separately. ALL THREE TRAINING KITS FOR ONE LOW PRICE! 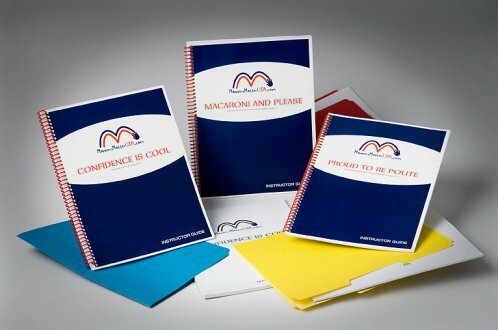 You will receive our "Macaroni and Please" & "Proud to be Polite" kits described above plus "Confidence is Cool"
“Confidence is Cool” is a comprehensive 40-hour curriculum designed as a training kit for child-care providers, educators and parents. The course is based on The Civility Group’s Confidence Camp. The content is perfect for 5 full days of summer camp, or you can easily adapt it for shorter lessons, offering you the ultimate in versatility. Content is intended for youth ages 8-12. Topics are organized into five sections: Attaining Confidence, What Does Confidence Look Like, Situational Confidence, Dining and Party Confidence, and a Review section. The straightforward materials package includes a clearly and simply explained 84-page instructor’s manual and 51-page master file for reproducing worksheets and participant materials. Ages 8-12 can be a complicated time for children, and understanding what is expected in social settings can help build their confidence. Studies suggest that children who are confident socially have higher moral IQ - in other words, they are better equipped to do what is right, with or without guidance.